alaTest a collecté et analysé 12 avis de consommateurs et d'experts pour le produit DCM2500 12-Cup Coffee Maker. La note moyenne du produit est 2.7 sur 5, tandis que les autres produits de même catégorie ont une note moyenne de 4.2 sur 5. Les testeurs apprécient l'ergonomie. Le rapport qualité/prix impressionne, mais les auteurs d'avis ont des doutes sur la fiabilité. Après analyse des notes de consommateurs et d'experts, de l'âge du produit ainsi que d'autres facteurs, et comparé aux autres produits de même catégorie, le DCM2500 12-Cup Coffee Maker obtient un alaScore™ de 75/100 = Bien. An attractive gadget with equally attractive price tag. 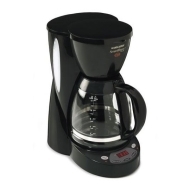 It is one of the lowest-priced coffee makers in the market but gives great performance. Sleek looks are an added bonus. It makes a great gift item and great kitchen addition. Highly recommended. The Black and Decker DCM2500. A great, low cost coffeemaker - with a flaw. Drip coffee-makers. When you get down to it, the basic technology of all of them is the same. You heat water, pour it through a coffee-filled filter, and coffee drips into the carafe. Automatic start timer, Automatic shut-off, No coffee grounds in the bottom of my cup. This machine works well. Other than a flawed lid which breaks easy, it is a good coffeemaker. The time should also be increased for the pot to stay hot. Will be taken back to KMart by the weekend. I had this one day and it doesn't work properly. They just don't make Black and Decker like they used to. I'll be getting another brand.